Calexico w/ Bahamas | Tonight at Mercy Lounge! Do you ever have one of those nights where you wish you could be in two places at once? With so many great shows in Nashville, especially as we approach the spring, it happens to us a lot. Tonight’s definitely one of those nights. All of our main contributors (who aren’t in Panama- have fun Andrew) will be at Lincoln, I mean Louis, C.K. tonight at TPAC. As excited as we all are to catch the funnyman, I know we’d all kill to clone ourselves and send our doubles to Mercy Lounge for Calexico and Bahamas! If you don’t already have plans to join us at Andrew Jackson Hall (and Louis is sold out, so you’re out of luck if you don’t), I can’t think of a better way to spend your Wednesday. Head over to Mercy and let us live out the show vicariously through you by tagging your tweets and Instagram pics with #NCFNN. You can also follow and @-reply us on ether service, we’re @NoCountryNash on both! 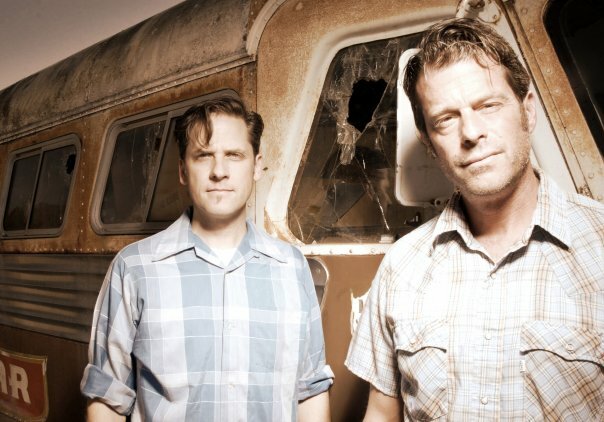 Calexico, indie rockers with a southwestern flair, have been making music together for over a decade and a half. The duo (and their permanent live band) have toured with heavy-hitters like Arcade Fire and Pavement, and have been regular fixtures at festivals like Bonnaroo over the years. Their ninth album, Algiers, was released last fall and provides perhaps the strongest and most focused encapsulation of the indie rock by way of southwestern, jazz, and early rock and roll sound that they’ve been perfecting for years. The band is in am amazing period of career renaissance and there’s never been a better time to catch them! Folk-tinged indie artist Afie Jurvanen (better known as Bahamas) has been generating a lot of buzz lately. With national press nods, an appearance on Conan, and tours with the likes of Michael Kiwanuka, Milo Greene, and Ben Howard, the Canadian singer-songwriter seems destined to have an even more impressive 2013. It’s been a little while since Bahamas has played Nashville (he hasn’t made it to town since before the release of his new album Barchords), and his live show is one you don’t want to miss out on! Calexico and Bahamas are performing tonight at Mercy Lounge. The show starts at 8PM (7PM doors) at tickets are still available here.